High is backing toward the Eastern New England shoreline this morning and this will remain in control for the rest of the week. Temperatures will be in the mid to upper 60's today and tomorrow. They should approach the low 70's on Thursday before a cooler day Friday and Saturday. 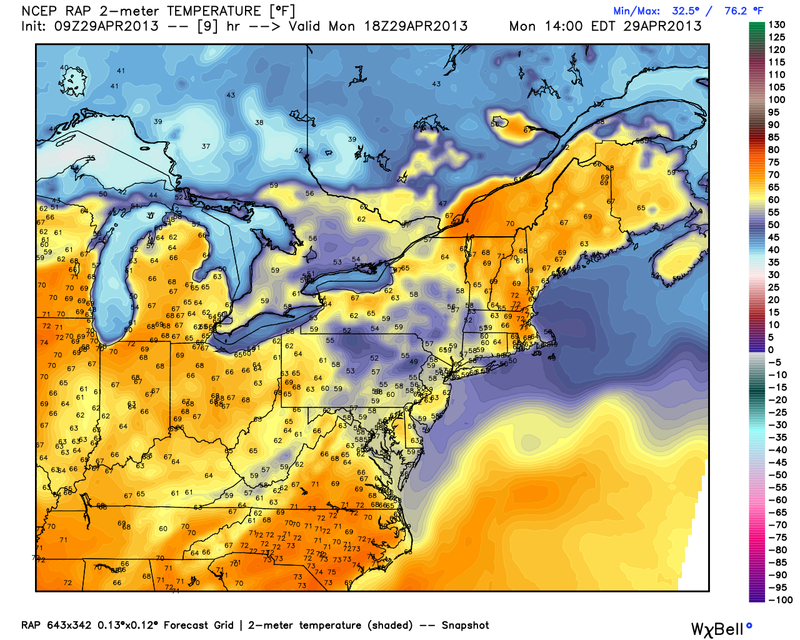 After the brief dance with cooler temperatures things are looking good in the extended long range. 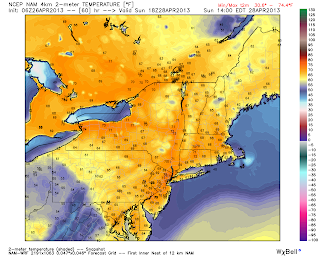 Areas in the Merrimack River Valley of NH/MA as well as the Connecticut River Valley in MA/CT will have the best chance to see 70 today. Tonight lows drop to low to mid 40's. Winds will remain light and out of the east. For Wednesday the high pressure will fall down the coast a bit. Temperatures will be slightly cooler tomorrow with more of an east wind. Low temperatures are in the upper 40's tomorrow night. On Thursday the high falls a bit to the south which will introduce a southwesterly flow into the region. This is the first week of May- astounding. Talk to you tomorrow. 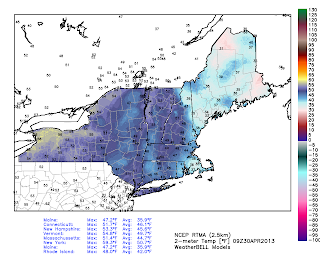 In general the next week to two weeks will be dry and mild in Southern New England. A developing block will keep high pressure in charge. Wind direction is the most important factor in determining temperature this week. Any easterly wind will keep temperatures down and correspondingly a wind out of the west will be warmer. A weakening upper air disturbance has generated some lift in the Mid Atlantic and Ohio Valley and the result is widespread showers in these regions. Low pressure is also working northeast out of the Carolina's. 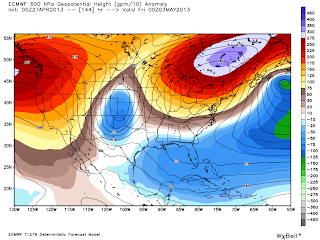 Here is the 500 mb chart showing the ridge over New England and the trough that extends just along the Appalachians. Similar weather. 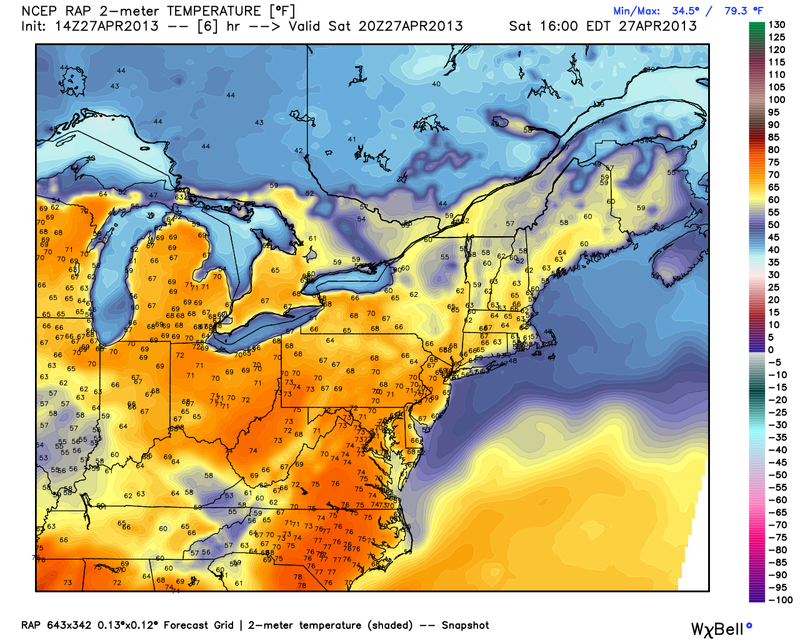 Temps in the mid to upper 60's. 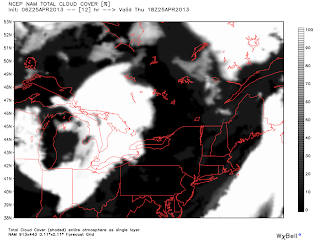 Skies will clear Tuesday afternoon and this will last into Wednesday. Winds will be generally light. Watching a sneaky backdoor cold front. 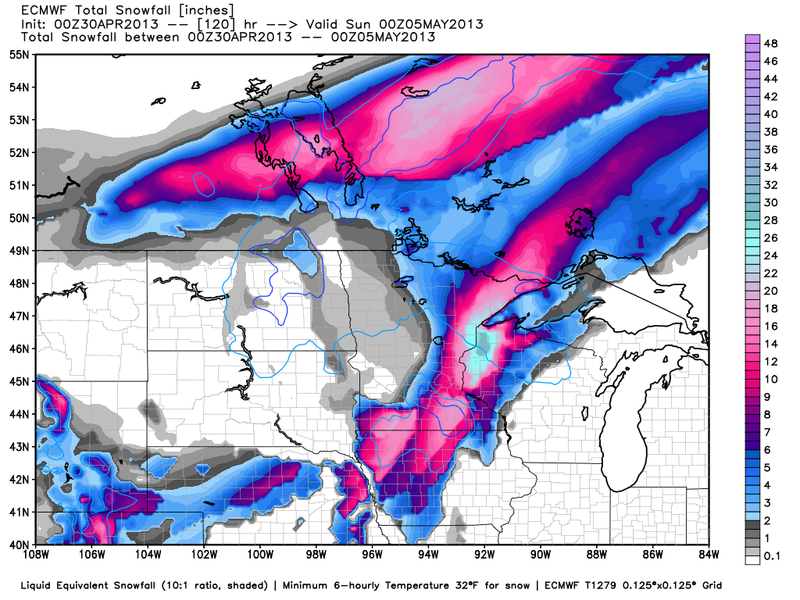 Will have to watch as it will make a major difference in temperature. Looks to be dry however, no matter the temp. 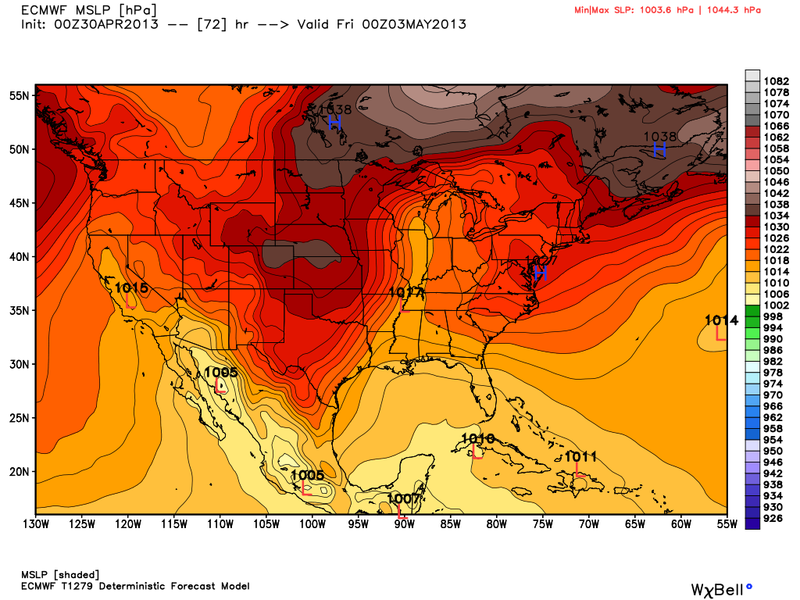 The forecast for New England in the next 7-10 days is rather boring (for me). It's great for all spring sports, cook outs, and any outdoor activity. The one drawback is that pollen counts should begin to rise and that stinks for a lot of people. However its a part of the natural seasonal cycle and with the pollen comes warmth. With high pressure in control today is nice. Winds will be slightly off the ocean keeping temperatures from soaring into the 70's. Temperatures drop into the mid 40's overnight. The pick of the weekend. High pressure moves offshore a bit changing the wind direction. Instead of an easterly component off the water there will be more of southwesterly component. It will still be off the water but the southern waters are warmer than the east due to the proximity of the gulf stream. That will lead to afternoon temperatures in the upper 60's. Much the same as Sunday. 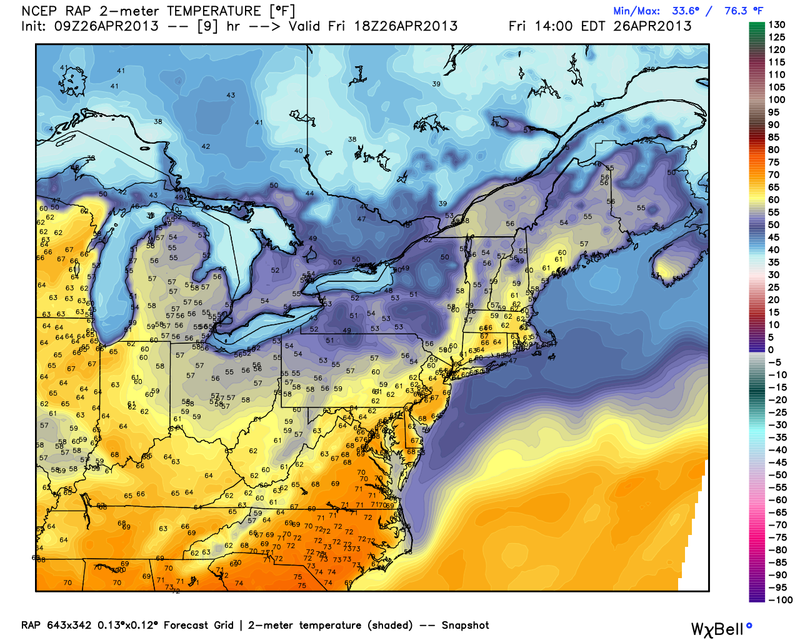 Temperatures will fall to the mid-upper 40's Sunday night. Monday will be in the mid 60's. 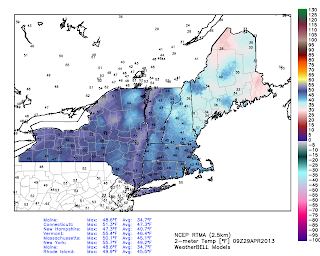 This time of year we really have to watch the sea breeze as it could be 49 in Boston but 66 in Worcester. I'm not expecting this on Monday because the high pressure will be just offshore- it would be difficult to get a wind directly east into Boston. These two days will be the coolest of the week. 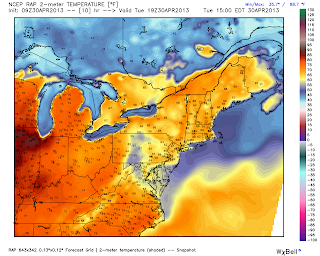 Temperatures will still climb into the upper 50's and low 60's. The sun will still be out but high pressure is going to mover further offshore. 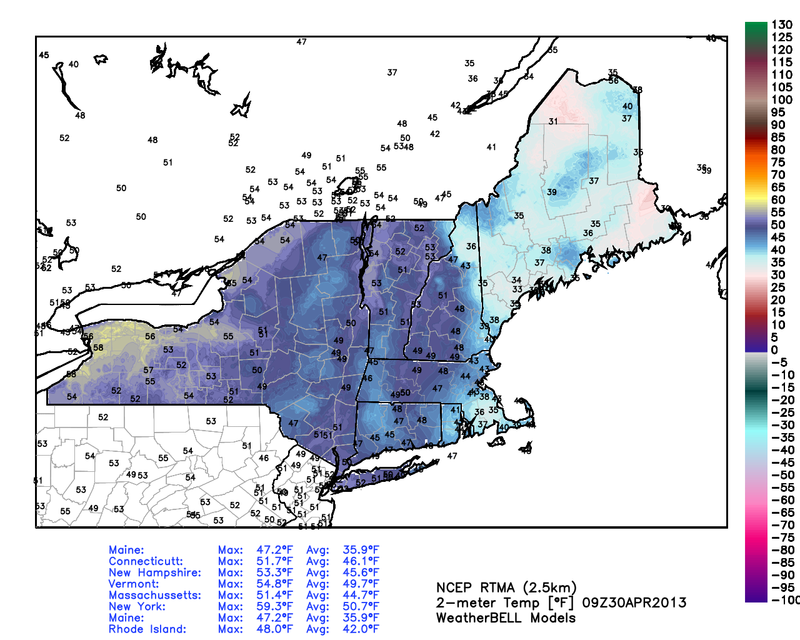 Colder temperatures in the mid levels will also be in place. 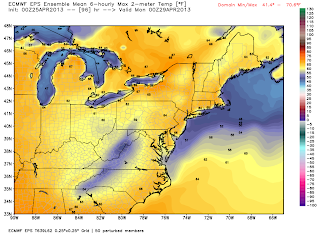 Friday looks to be around 70 BUT the sea breeze may create a drastic temperature gradient all the way to 495. I'll monitor throughout the week. 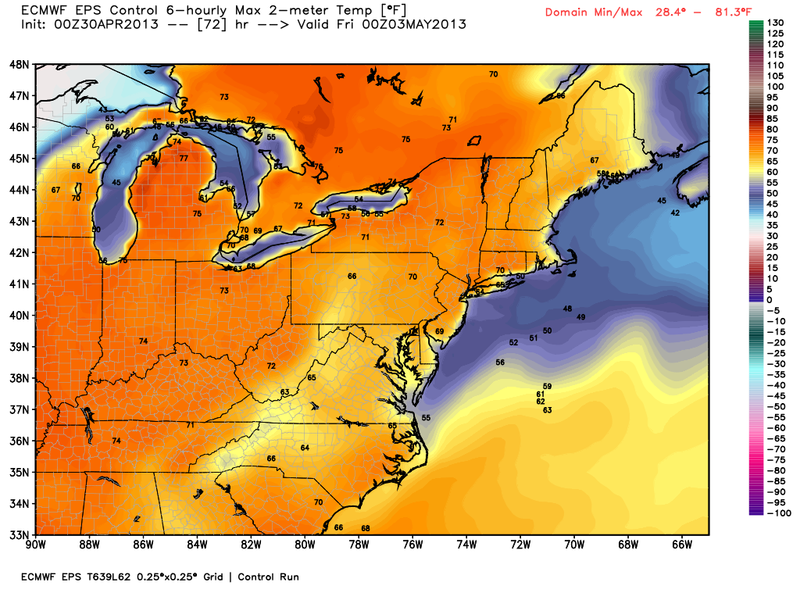 Next Saturday at this point looks to be in the mid to upper 70's. Have a great weekend! An upper level disturbance will swing through New England today touching off an isolated shower or storm. The weekend will be top notch with mostly sunny skies and temperatures in the mid to upper 60's. Sunday will likely be around 70. After today's light rain there will be an extended dry period for 7-10 days. Guidance is hinting at something around day 9-10 coming out of the SW Atlantic and being energized by an upper level system as it moves up the coast. More on that tomorrow and next week. 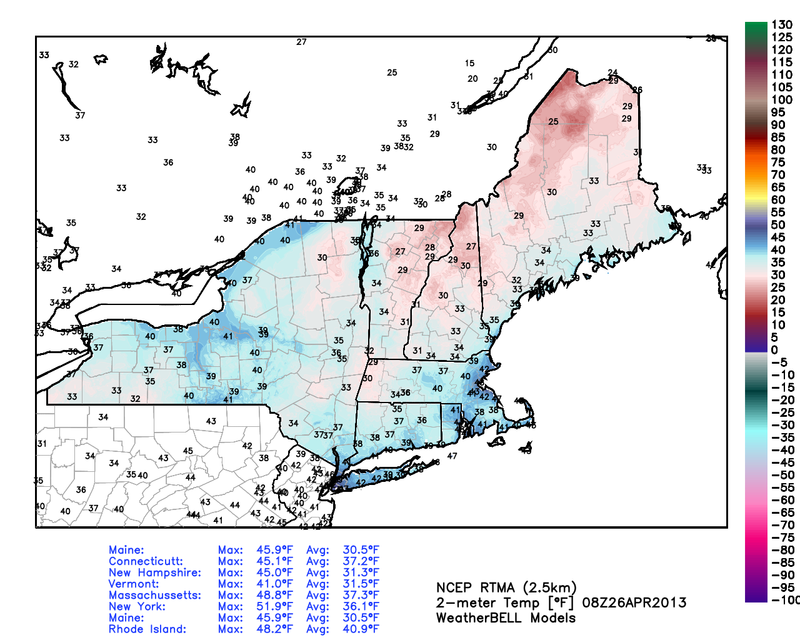 Temperatures this morning are chilly especially outside of SE New England. However cutting in between those two high pressure areas in the East is an upper level feature. Low temperatures will drop into the mid 40's Saturday night. That's all for today, have a great weekend. 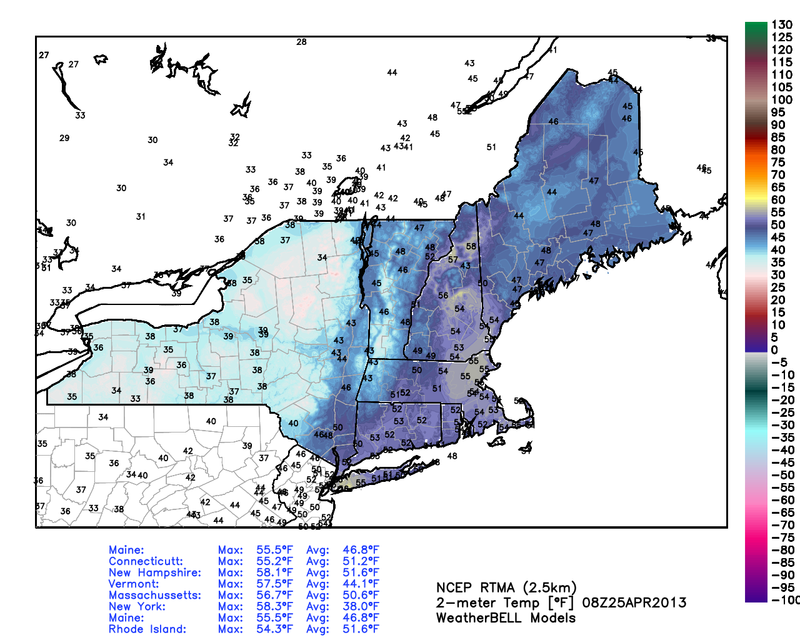 A weakening cold front is pushing through Southern New England this morning. 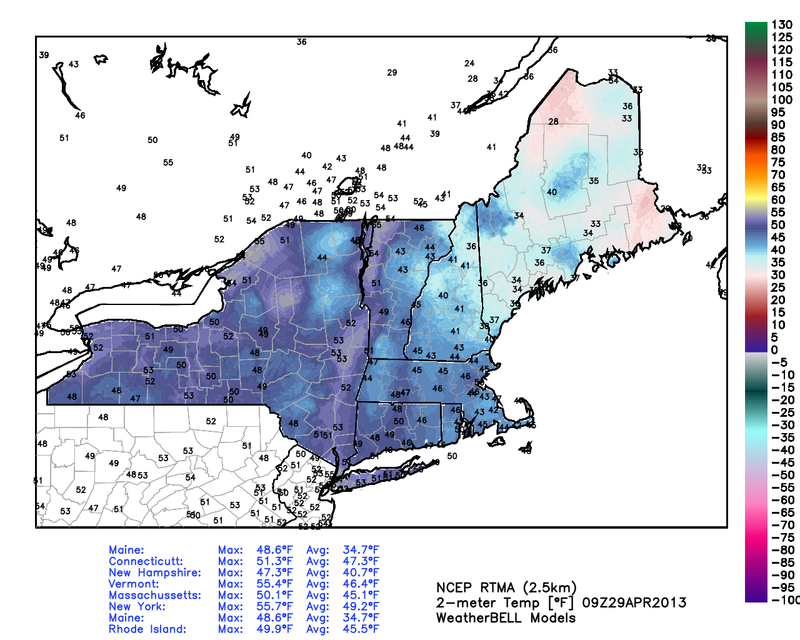 The warmth from yesterday is gone, but so is the record cold from Tuesday. In fact we will be closer to yesterday than the cold of Tuesday for the next week to 10 days. We seem to have turned the corner towards the second half of Spring. Meanwhile in the rest of the country here is what the last week has looked like. 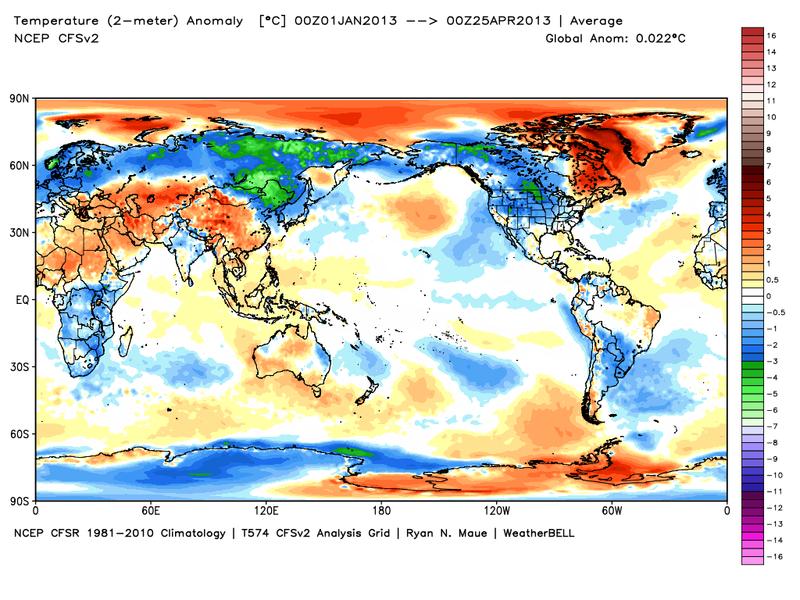 Some 10,000 cold temperature records have been set in the last six weeks. 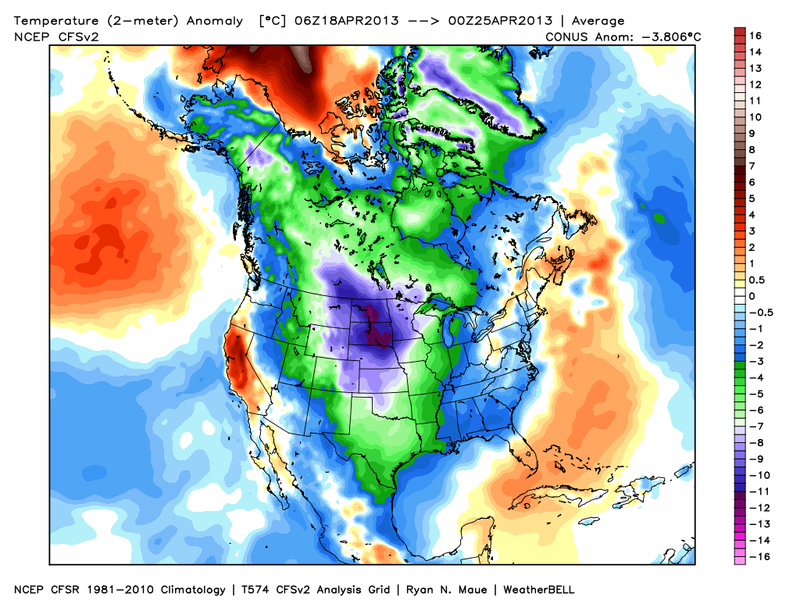 It has been as extreme a late season cold shot in decades. Now if we flipped this around and it was heat it would be plastered all over the national news. Last summer we were told "this is what global warming looks like" after record heat. 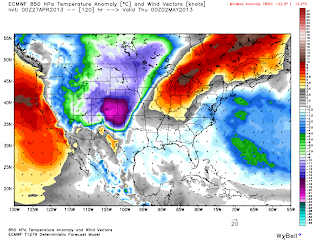 Now I am educated enough in meteorology to recognize that hot/cold temperature records don't mean much of anything but the bias in coverage of warm/cold events is remarkable (but not really if you have followed the debate). Skies will be clearing this afternoon and temperatures will shoot up to around 60 degrees. The rain will be gone by 11 am. The short range models want to intensify a band of showers that will move into SE MA between 8-10 am. 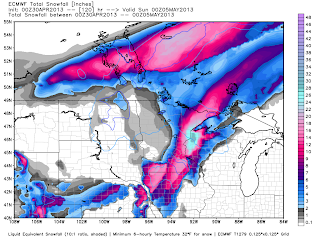 The NAM hires also shows this cluster and monitoring radar trends it seems plausible. I can't even rule out some thunder and lightning with this convection. So whatever forms will be gone and will leave a great afternoon. Overnight most of us drop into the low 40's. SE MA, the Cape and Islands will be in the upper 40's. Friday will feature similar temperatures as today but is a chance of an afternoon shower or thundershower. This would be one hell of signal to take into Hurricane Season. Chilly Couple of Days, 70 next week?